Exactly What Is Atrial Fibrillation? A good date to learn more about Afib is today - Atrial fibrillation (also known as Afib) is the most common type of heart arrhythmia. Arrhythmia is a problem with the rhythm of the heartbeat. During an arrhythmia, the heart can beat too fast, too slow, or with irregular rhythm. Atrial Fibrillation occurs when rapid, disorganized electrical signals cause the atria (AY-tree-uh), the two upper chambers of the heart, to fibrillate. The term "fibrillate" means to contract very fast and irregularly. In Atrial Fibrillation, blood pools in the atria and isn't pumped completely into the ventricles, the heart's two lower chambers. As a result, the heart's upper and lower chambers don't work together as they should. Often, people who have Atrial Fibrillation may not feel its symptoms. 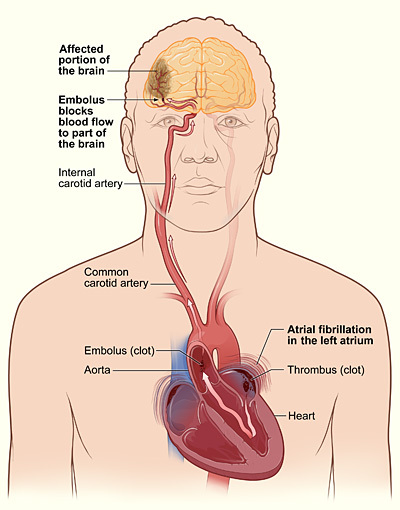 However, even when Afib is not noticed, Atrial Fibrillation can increase the risk of stroke. In some people, Atrial Fibrillation can cause chest pain or heart failure, particularly when the heart rhythm is very rapid. Atrial Fibrillation may occur rarely or every now and then, or it may become a persistent or permanent heart rhythm lasting for years. To understand Atrial Fibrillation, it helps to understand the heart's internal electrical system. The heart's electrical system controls the rate and rhythm of the heartbeat. In Atrial Fibrillation, the heart's electrical signals don't begin in the SA node. Instead, they begin in another part of the atria or in the nearby pulmonary veins. The signals don't travel normally, and they may spread throughout the atria in a rapid, disorganized way. This can cause the atria to fibrillate. Thus, the atria and ventricles no longer beat in a coordinated way. This creates a fast and irregular heart rhythm. In Atrial Fibrillation, the ventricles may beat 100 to 175 times a minute, in contrast to the normal rate of 60 to 100 beats a minute. Most of the symptoms of Atrial Fibrillation are related to how fast the heart is beating. If medicines or age slow the heart rate, afib symptoms are minimized. Atrial Fibrillation may be brief, with AF symptoms which may come and go and end on their own. Or, the condition may be persistent and require treatment. Sometimes Atrial Fibrillation is permanent, and medicines or other treatments can't restore a normal heart rhythm. People who have Atrial Fibrillation can live normal, active lives. For some people, treatment can cure Atrial Fibrillation and restore normal heart rhythms. For people who have permanent Atrial Fibrillation, treatment can successfully control symptoms and prevent complications. Treatments include medicines, medical procedures, and lifestyle changes. In paroxysmal atrial fibrillation (Atrial Fibrillation), the abnormal electrical signals and rapid heart rate begin suddenly and then stop on their own. Symptoms can be mild or severe and last for seconds, minutes, hours, or days. Persistent Atrial Fibrillation is a condition in which the abnormal heart rhythm continues until it's stopped with treatment. Permanent Atrial Fibrillation is a condition in which a normal heart rhythm can't be restored with the usual treatments. Both paroxysmal and persistent Atrial Fibrillation may become more frequent and, over time, result in permanent Atrial Fibrillation. Atrial fibrillation (Atrial Fib) occurs when the electrical signals traveling through the heart are conducted abnormally and become very rapid and disorganized. This is the result of damage to the heart's electrical system. The damage most often is the result of other conditions, such as coronary heart disease (also called coronary artery disease) or high blood pressure, affecting heart health. Sometimes, the cause of Atrial Fibrillation is unknown. More than 2 million people in the United States have atrial fibrillation (Atrial Fibrillation). It affects both men and women. The risk of Atrial Fibrillation increases as you age. This is mostly because as you get older, your risk for heart disease and other conditions that can cause Atrial Fibrillation also increases. However, about half of the people who have Atrial Fibrillation are younger than 75. Atrial Fibrillation is uncommon in children. Atrial Fibrillation also is more common in people who are having heart attacks or who have just had surgery. Other conditions that increase Atrial Fibrillation risk include hyperthyroidism (too much thyroid hormone), obesity, high blood pressure, diabetes, and lung disease. Other factors also can increase your risk of Atrial Fibrillation. For example, drinking large amounts of alcohol, especially binge drinking, increases your risk. Even modest amounts of alcohol can trigger Atrial Fibrillation in some people. Caffeine or psychological stress also may trigger Atrial Fibrillation in some people. Some evidence suggests that people who have sleep apnea are at greater risk for Atrial Fibrillation. Sleep apnea is a common disorder in which you have one or more pauses in breathing or shallow breaths while you sleep. Metabolic syndrome also increases your risk of Atrial Fibrillation. People who have this condition have a group of risk factors that increase their risk of heart disease and other health problems. Recent research suggests that people who receive high-dose steroid therapy are at increased risk of Atrial Fibrillation. This therapy, which is commonly used for asthma and certain inflammatory conditions, may act as a trigger in people who already cardiac dysrhythmia, irregular heartbeat and other afib risk factors. Atrial fibrillation (A-Fib) often causes the ventricles to contract faster than normal. When this happens, the ventricles don't have enough time to fill completely with blood to pump to the lungs and body. Atrial Fibrillation has two major complications stroke and heart failure. During Atrial Fibrillation, the atria don't pump all of the blood to the ventricles. Some blood pools in the atria. When this happens, a blood clot (also called a thrombus) can form. Blood-thinning medicines to reduce the risk of stroke are a very important part of treatment for people who have Atrial Fibrillation. Heart failure occurs when the heart can't pump enough blood to meet the body's needs. Atrial Fibrillation can lead to heart failure because the ventricles are beating very fast and aren't able to properly fill with blood to pump out to the body.